Denny Jump (Bellevue, WA, United States) on 23 August 2018 in Architecture. First, please allow me to apologize for posting this image in the middle of the day in the American Pacific Time Zone...it was not supposed to be posted until 24 August!! - It's a VERY long story! 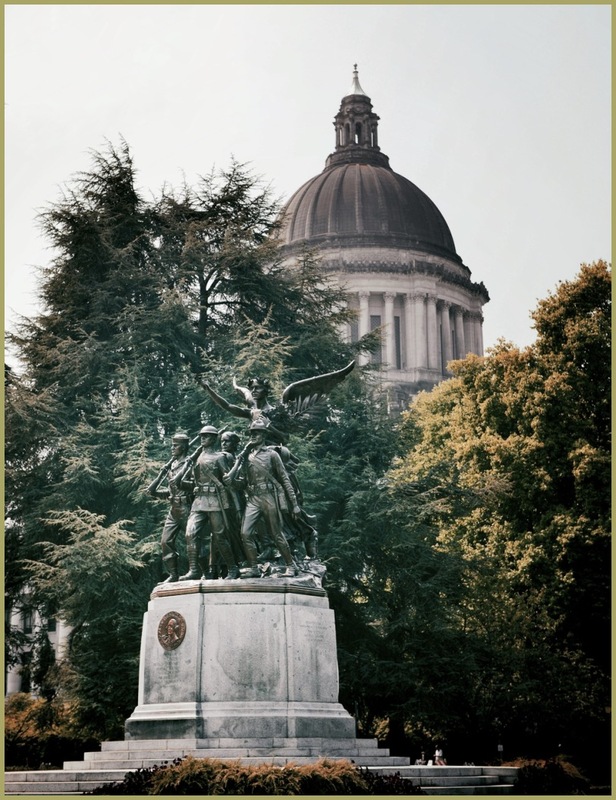 At any rate, this was another favorite view of mine as we explored the grounds of the Washington State Capital in Olympia, Washington, USA.. The Winged Victory Monument was so amazing to see in this perspective. I will have more images showing interior and exterior portions of the Capital building...and other things to see, as well. I agree that this perspective is superb, especially with the big dome looking in the distance. No need to apologise for processing your photos, that is what post processing is there for - to enhance our vision and to produce the best photo we possibly can. That smoke has been awful and still is down this way. @Steve Rice: Certainly has.....seems to be improving just a bit finally this evening (Friday)....Hope all is well with you folks. Thanks Steve.. Interesting shot. I'll all for processing to enhance a shot.